For years, the secrets to great teaching have seemed more like alchemy than science, a mix of motivational mumbo jumbo and misty-eyed tales of inspiration and dedication. But for more than a decade, one organization has been tracking hundreds of thousands of kids, and looking at why some teachers can move them three grade levels ahead in a year and others can’t. Now, as the Obama administration offers states more than $4 billion to identify and cultivate effective teachers, Teach for America is ready to release its data. This tale of two boys, and of the millions of kids just like them, embodies the most stunning finding to come out of education research in the past decade: more than any other variable in education—more than schools or curriculum—teachers matter. Put concretely, if Mr. Taylor’s student continued to learn at the same level for a few more years, his test scores would be no different from those of his more affluent peers in Northwest D.C. And if these two boys were to keep their respective teachers for three years, their lives would likely diverge forever. By high school, the compounded effects of the strong teacher—or the weak one—would become too great. Parents have always worried about where to send their children to school; but the school, statistically speaking, does not matter as much as which adult stands in front of their children. Teacher quality tends to vary more within schools—even supposedly good schools—than among schools. But we have never identified excellent teachers in any reliable, objective way. Instead, we tend to ascribe their gifts to some mystical quality that we can recognize and revere—but not replicate. The great teacher serves as a hero but never, ironically, as a lesson. At last, though, the research about teachers’ impact has become too overwhelming to ignore. Over the past year, President Barack Obama and his education secretary, Arne Duncan, have started talking quite a lot about great teaching. They have shifted the conversation from school accountability— the rather worn theme of No Child Left Behind, President George W. Bush’s landmark educational reform—to teacher accountability. And they have done it using one very effective conversational gambit: billions of dollars. 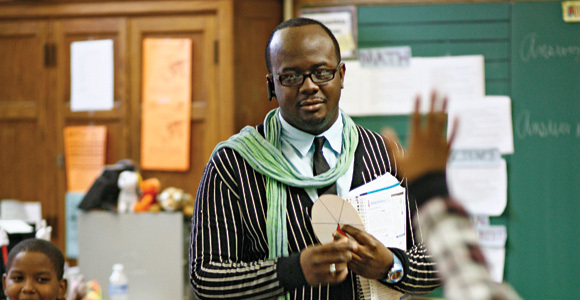 Based on his students’ test scores, Mr. Taylor ranks among the top 5 percent of all D.C. math teachers. He’s entertaining, but he’s not a born performer. He’s well prepared, but he’s been a teacher for only three years. He cares about his kids, but so do a lot of his underperforming peers. What’s he doing differently? Teach for America, a nonprofit that recruits college graduates to spend two years teaching in low-income schools, began outside the educational establishment and has largely remained there. For years, it has been whittling away at its own assumptions, testing its hypotheses, and refining its hiring and training. Over time, it has built an unusual laboratory: almost half a million American children are being taught by Teach for America teachers this year, and the organization tracks test-score data, linked to each teacher, for 85 percent to 90 percent of those kids. Almost all of those students are poor and African American or Latino. And Teach for America keeps an unusual amount of data about its 7,300 teachers—a pool almost twice the size of the D.C. system’s teacher corps. Until now, Teach for America has kept its investigation largely to itself. But for this story, the organization allowed me access to 20 years of experimentation, studded by trial and error. The results are specific and surprising. Things that you might think would help a new teacher achieve success in a poor school—like prior experience working in a low-income neighborhood—don’t seem to matter. Other things that may sound trifling—like a teacher’s extracurricular accomplishments in college—tend to predict greatness. A powerful message for educational institutions – it’s all about the teacher! !